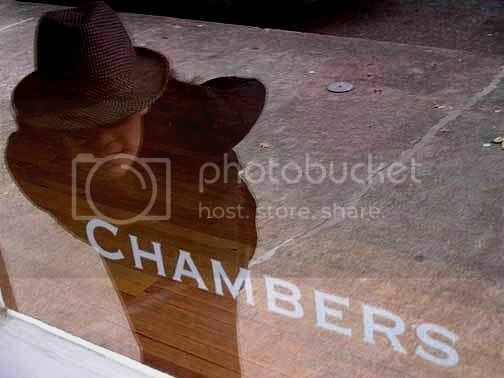 yeeeeeeess...i just HAD to take a sneak peek into chambers before the big opening tomorrow night. i must admit, my appreciation for the curator's eye has been upped a notch. i felt as though i was seeing my work for the very first time. the pairings are well orchestrated - not just spaced as one solid line across the wall. although ecstatic about the show, i was more than a little stressed about my interview last night with eva lake, set to air on next monday's artstar (5pm pacific time). i even had a trusty kleenex wadded up in my skirt in the event of any barbara walters teary moments. but, my biggest fear was not being able to fill up an hour's worth of conversation...could i possibly talk about my art, control my quivering voice, provide enough intelligent banter without locking up in a nervous fit, pathetically falling to the ground, assuming a fetal position while sucking my thumb and soiling myself? this primal terror is something i deal with on a daily basis...buuuuut, don't we all? i'm happy to report the interview went much better than i expected..i credit eva for setting me at ease and asking all the right questions at just the right times. hey, and no matter how silly or stupid headed i may have seemed....at LEAST i didn't throw up mid interview.. I can't wait to download your interview with Eva onto my ipod. Congratulations. Re: You're a rock star. enjoy yr opening tomorrow night! this place is a dream, you'd LOVE it. it's very old world st. louis-y.. kewl!!!! and yah, glad you didn't barf or anything. have a blast at your opening, m'k? and pretend i'm there with you. I will be in spirit, you know! can't wait to see the cam up- how fun!!! i'm thinkin' i should pack my tap shoes when i come see you...! I don't think I've said it yet so CONGRATULATIONS! ooooooh, you were missed!! you're one of my favorite gallery hoppin' buddies!!! I can't wait to hear it! I'm so proud of you!!!!! well, i'm glad i did it....that's for sure. even though i was a ball of nerve endings waiting to snap. hey, and just so ya know....eva wants to come down here and do an expose on the L.A. art world...and mat and you will be on the top of her list, i'm SURE!!! and who knows, maybe i can capture it all on the artworkslive webcam??!!!!!! !